Long ago, the wizards had vanished from the world, and all knowledge was left hidden in riddles. Morgon, prince of the simple farmers of Hed, proved himself a master of such riddles when he staked his life to win a crown from the dead Lord of Aum.But now ancient, evil forces were threatening him. Shape changers began replacing friends until no man could be trusted. So Morgon was forced to flee to hostile kingdoms, seeking the High One who ruled from mysterious Erlenstar Mountain.Beside him went Deth, the High One's Harper. Ahead lay strange encounters and terrifying adventures. Bahzell is no knight in shining armor, and besides he has too many problems of his own to be messing with anybody else's problems - let alone the War God's. Unfortunately, the War God has other ideas for him. The land of Terre d'Ange is a place of unsurpassing beauty and grace. It is said that angels found the land and saw it was good...and the ensuing race that rose from the seed of angels and men live by one simple rule: Love as thou wilt. 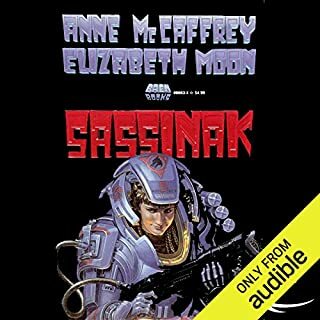 ©1988 Elizabeth Moon (P)2010 Audible, Inc. This first book hints at the promise of a great series. The feel of this book is entirely like that of a prologue, what I mean is that the entire books seems like it is setting up something for later. The story itself is actually a bit slow as the entire purpose seems to be to introduce and develop the main character, Paks (aka Paksenarrion). Yes there are some battles, but they are almost glossed over and at no time does it really seem that Paks is in any REAL danger, probably because at the start of the book we learn that the entire book is a memoir of some sort. So who is Paks? Well, Paks is/was(?) a person who achieved some sort of greatness, exactly what and how she achieved that greatness is apparently the content of this series. I don't want to give too much away, the mystery of whom and what Paks becomes is central to the enticement of the novel. I fear if I tell you my suspicions, it will diminish some of the pleasure you may feel reading the novel. Overall this book kept my attention and I looking forward to book 2. To be honest it failed to REALLY grab me, and if the second book continues in this way I can see myself becoming bored. But, if it fulfills the promise foreshadowed in this book the series might be fantastic. I read this book when it was first released in 1988. When my husband and I started collecting audio book titles we searched for books that we had once enjoyed reading. We had been looking for The Deed of Paksenarrion ever since we started listening to audio books about a decade ago. This had been one title that had been overlooked for conversion to the audio book format. When it finally came out I snapped it up from Audible.com and I have not regretted it. 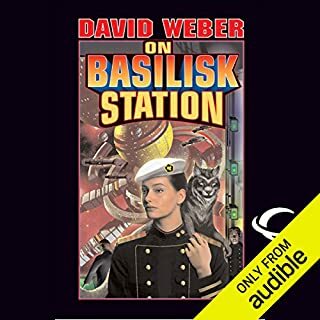 Narration: I have been unhappy with some of Jennifer Van Dyck's narrations in the past, mostly when she followed a favored narrator in a series and didn't check previous pronunciations. This time she is coming into the series fresh and has made it her own. I think she has done an exceptional job of making the Paksenarrion tales come to life and have thoroughly enjoyed listening to the book that I enjoyed reading many years ago. Kudos to Ms. Van Dyck for her performance in the Paksenarrion titles. Paksenarrion brings to mind an epic journey similar to The Obsidian Trilogy by Mercedes Lackey and James Mallory, or The Wheel of Time series by Robert Jordan, only not as lengthy. Alas, I sometimes wish that it were longer, or that Elizabeth Moon were a more prolific writer. Though what she does produce is always worth the time to peruse. For lovers of the fantasy genre you can't go wrong with any of the Paksenarrion books. Now if the publishers would go back a bit further and include "Liar's Oath" and "Surrender None" and you would have the complete world from which Paksenarrion comes. 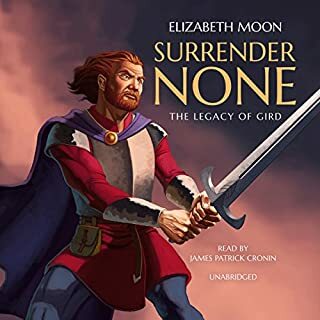 "Liar's Oath" and "Surrender None" predate Paksenarrion and explain St. Gird and his assistant Luap and the formation of the Fellowship of Gird. I remember first reading this book over a decade ago, and I fell in love with this series. A must read in my opinion if you like high fantasy and believe there is good in the world, all 3 in the series is phenomenal. The narrator is also a good choice, I did enjoy listening to her as her other narrations (Mystic & Rider by Sharon Shinn). I really enjoyed listening to this book. It was an unusual book for me - I am not accustomed to reading about a female military heroine - even so, I was not disappointed. After reading this book, I had to find out what happened and eventually finished listening to the series. I was not disappointed I did that. If you are looking for a new series, this might interest you. Other books you may like: The Chronicles of Amber (apparently an old series, but I just read it for the first time and loved it), the Riftwar saga by Raymond E. Feist (not on Audible yet, but worth reading), and Trudi Canavan's Black Magician series. This is assuming you have already read Jim Butcher's Codex Alera series, Brandon Sanderson's Mistborn series, his Elantris stand alone book, The Wheel of Time series by Robert Jordan, and G. R. R. Martin's A Song of Ice and Fire series (Beware - no one is sure when this series will be completed). If you haven't read this list, start with these ones. If you have completed the above list, you might like Peter V Brett's Painted Man/Warded Man series, the Night Angel trilogy by Brent Weeks, Robin Hobb's Soldier Son trilogy, her Tawny man Series, or her Farseer trilogy. I enjoyed all of the above series. Some of them were more enjoyable that others, so, please read other reviewers to see if they would be a good fit for you. If there was a series you enjoyed, please share it. Thanks. SFD starts like just an unusual fictional period piece. It does not take long, however, to see the diamond in the rough in Elizabeth Moon's heroine Paksanarrion. Set in the "usual" medieval fantasy setting, this book is like other fantasies as Tarzan might have been to Jane Goodall. Paksa is an ordinary soldier - a woman no less. This most unusual book chronicles her initiation and trials as a warrior in a style unusual to fantasy. The story is told from the soldier's POV, not the POV of rulers and generals. Depiction of Paks' evolution as a soldier employs military strategy as a backdrop - quite convincing. I gfound myself sneaking reads between checks on my work. The definition of a good book? Can't put it down. I rated it 4 because I thought that character development and application of psychology could have been stronger. That said, it's Moon's first book. Very promising indeed. Try it for new flavor in fantasy. This is the style that brought me to the high fantasy genre. A fantasy world with depth and nuance, making subtle moral comments on the real world. 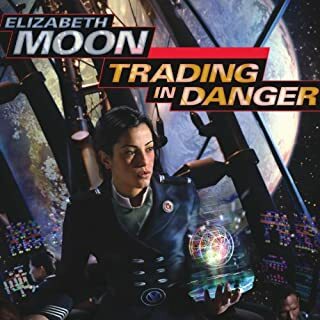 I had previously not read any of Moon's work, though I have long intended to read the Planet Pirates series she co-authored with Anne McCaffrey. 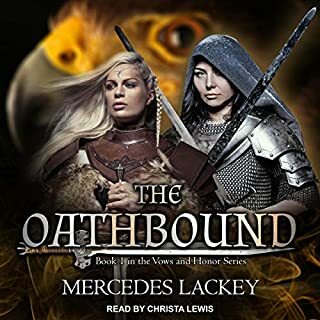 I was reminded of some of my favourite Mercedes Lackey novels while listening to this. Not in detail, but in overall feel. A great book, and I'm looking forward to continuing the series. Jennifer Van Dyck's narration is excellent, well paced and lively, with distinct character voices and emotion where needed. Really brings the book to life. i really did read the books 3 times, And have listened to the Deed of Pakanarion once a year since the audiobook became available. its a real kick to read the beginning knowing the end and appreciate the long vision of a great story teller that Eluzsberh Moon is. 25 years ago Sheepfarmer's Daughter got into print and Paksenarrion was introduced to the first reader, over the years Deed of Paksenarrion became a model for fantasy genre. The story of Honor, Will and Courage, the story of mythical beasts and beautiful creations, the story of foul deeds and Noble sacrifice. Okay for a debut novel, but not very refined. World strong. characters flat plot weak. Wanted to feel more connexion between characters and know what Paks was thinking more often. great story with an awful narrator, the narrator injected a number of awful accents thus spoiling the enjoyment. 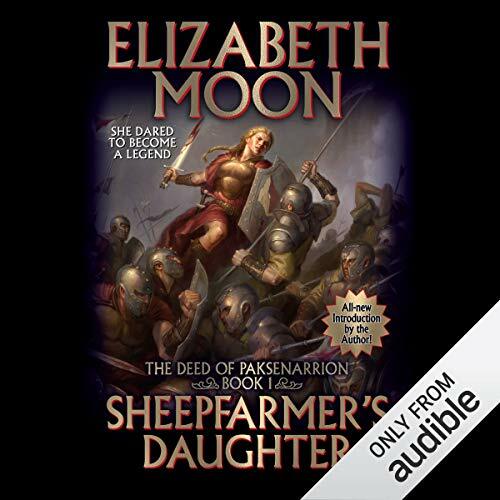 Where does Sheepfarmer's Daughter rank among all the audiobooks you’ve listened to so far? Whilst I prefer to spend my credits on longer books, I thoroughly enjoyed Sheepfarmer's Daughter. It is the first in the Paksennarion series and I see a long and happy relationship with Elizabeth Moon's fantasy books on myy horizon. I do love a thumping good adventure and I think that's what I have in store....lovely book. What was one of the most memorable moments of Sheepfarmer's Daughter? There are a couple of AHA! moments...it flows very well. I usually prefer English narators for some reason...but Ms Van Dyck did a sterling job and I think I'll happily stick with her through the series. I was delighted to come across this author. As a sci-fi/fantasy reader it's such a thrill to find an author that I haven't come across before. Looking forward to the restt of the series. I've lost count of how many times I've read the Paksenarrion series, and I was delighted to find it available on Audible. The writing style is perhaps a little old-fashioned now, but as a war story set in a fantasy world, I found it compelling. The fantasy elements are introduced gradually and realistically. The exploration of religion - both personal and corporate - is fascinating (especially in the following books). The author's experience of warfare shows. Some people may find it a little tedious, but I really liked reading about the minutiae of military life, combined as it was with my favourite genre.. The narrator takes a little getting used to, but on the whole I enjoyed the performance. This book may not be for everyone but personally I loved the detail and how you felt immersed in Paks’s life as she trained to be a fighter. The author seemed to really know her stuff. People got realistically injured, tired and too weak to fight instead of being superhuman. On the downside Paks is one of those too good characters that can do little wrong. It didn’t matter much but I would have liked to see a bit more inner emotional depth e.g when friends she trains with die. 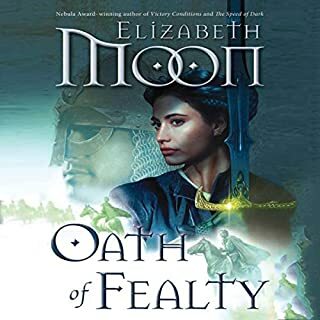 Written in the style so come to the fantasy genre, Elizabeth Moon tells a gripping tale in a fine fashion. It does nothing orignal in how the story is told, but what it does is exceptionally good. The few changes in perspective freshen the narrative at points. The fact that the story is mainly told from one perspective though, keeps it grounded and easy to follow. The world that is introduced in this first book of the series, is deeply immersive and intersting. I get a great sense of a world we could easily see Conan striding through, or any such hero of high adventure. This almost dark age or even classical feel adds a lot more then a more generic fantasy setting. You will follow the tale of Pox, a sheepfarmer's daugther, and her adventures in becoming a mercanary. This coming of age story, is well told. The female protagonist does not follow a sterotypical route some female character could take, and this is great to see. The other supporting characters are well told and rounded, with some great villians to finish the piece. This is a good book. It doesn't need to push the bounds of literary style to show that it is a fine read for any fan of fiction. What did you like most about Sheepfarmer's Daughter? I read these books several years ago and I'm new to audio books (something I well nd truly regret). The story seems fairly simple but the detail fleshes it out. I actually find that I am enjoying it more listening to it. Paks is obviously the stand out character but my heart belongs to Sergeant Stammel. I love the books of this series, so was slightly disappointed to find the audio a little samey. The narrator has a good voice, but I found it hard to tell the difference between the characters. This wasn't helped by the author seeming to reuse several names an awful lot. Having said that, it's a rip-roaring high fantasy adventure, and not at all run of the mill. You get magic and Knights in shining armour, but only from a distance as Paks, former shepherd, runs away to join a mercenary company. The author's own military background gives the story depth and detail, the misery of campaign as well as the solidity of bonds formed is brought across strongly. It's interesting to consider the hardships faced by a mercenary company operating under essentially medieval conditions. The heroine is occasionally a bit TOO perfect, and remains resolutely stubborn and naive right through to the end, but it is a solidly entertaining story nonetheless. Loved it so freaking much! best book. readings a bit chalky but really the best book.